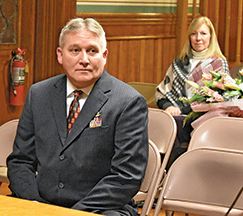 The Fairhaven Selectboard wel­comed the town’s new Veterans Agent, and inspected the town’s new ladder truck at its meeting on Monday, 1/14/19. After opening up the meeting, the board took a quick recess to go outside and inspect the new Ladder 1 (see story on page 12), which boasts the latest technology. The board also approved the appointment of Bradford Fish of Acushnet as the town’s new Veterans Agent. The town has been operating without an agent for several months, with the work falling on Adminis­trative Secretary Jane Bettencourt. The board presented Ms. Betten­court with a bouquet of flowers to let her know that they appreciated her extra effort. 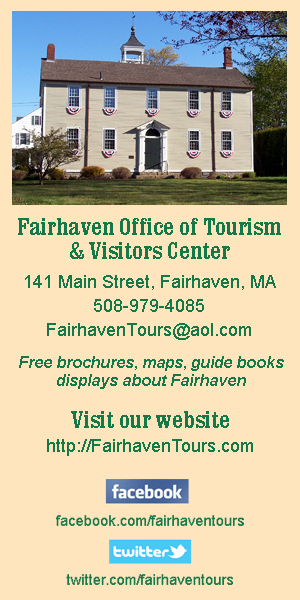 Bradford Fish of Acushnet meets with Fairhaven Selectboard members on 1/14/19, after being appointed as the town’s new Veterans Agent. His wife Carol watches from a few rows back. Photo by Beth David. Mr. Fish was hired by Town Administrator Mark Rees, subject to approval by the Board, after a search committee picked him as their first choice. He is currently Veteran’s Service Officer for the town of Westport. He served as a Marine and the Army National Guard. He also worked for the Department of Defense and the US Post Office. “I love what I do. I love what I do for a living,” Mr. Fish told the board. He has four grown children, and lives in Acushnet with his wife Carol. Mr. Fish should be able to start in a couple of weeks. In another matter, Mr. Rees reviewed the report from HKT Architects, which studied town buildings and made recommenda­tions for repairs and maintenance. The total cost of renovations is more than $100 million. The firm created a prioritized list of nine projects for the town to plan on. The number one recommendation was for a new public safety facility for the police and fire departments, Harbormaster, and a new animal shelter, estimated at $40.6 million if constructed in 2021. The town does not own the 4.5 to 4.75 acres needed for the project, so the cost includes some money to buy land. Mr. Rees told the board that he and the chiefs have a few sites in mind, but they need to send out a Request for Proposal (RFP) first. He said the only way to get some of the projects done would be with debt exclusions, which means an override on the tax cap that Proposition 1 1/2 imposes on municipalities in Mass. Second on the list was relocating he school administration offices to the old Tripp School, 56 Bridge Street, with renovations, and also using it for other high school needs, and possibly town offices. Work to the building includes gutting the interior, some structural and exterior work, and some HVAC work. Total is estimated at about $7.4 million if the work is done in 2022. Third on the list is the Senior Center and Recreation Center building, with recommendations for additions and renovations. Work at that site would include exterior maintenance that has been deferred, electrical and plumbing work. The recommendation also includes an additional 990 square feet of for the recreation side and some renovations to allow more office space. Total for those recommendations is about $5.4 million in 2022. Number four on the list is improving wheelchair accessibility in town hall, exterior renovations and mechanical and electrical upgrades totalling about $383K if done in 2021. Number five on the list is renovations to the LL Wood and East Fairhaven Elementary schools to correct accessibility issues and miscellaneous issues with the mechanical systems, totalling about $2 million, but with state grants, the town’s portion would be less, around $1.16 million if done in 2022. The BPW is six on the list, with a recommendation for a new vehicle storage building and interior renova­tions, at a cost of $5.59 million if done in 2023. Number seven on the list is Hastings Middle School improve­ments, which include roof replace­ment, demolishing the modular classroom, HVAC upgrades, and other exterior and interior work. Cost is estimated at $11.5 million if done in 2023, with 40% reimbursed by the state. Fairhaven High School is eight on the list, with improvements to heating, plumbing, electrical, and masonry work slated to be done in 2024 for $25.5 million, but with some reimbursement, about 40% from the state. The Millicent Library made the high priorities list at number nine, for upgrades to the ventilation and air conditioning systems, electrical and plumbing. Cost of the project is estimated at $2.4 million in 2024, with a variety of funding sources to take some of the sting out of it, leaving about $1.2 million to come from the general fund. The study also breaks out costs for renovating the animal shelter as a separate project, or demolishing the emergency management building on Sconticut Neck Road, and for renovating the School Administration building on Washington Street. In another matter, the board was supposed to meet with Hatem El Rifai, the owner of Fairhaven Getty, to make changes to his license, but they did not meet with him. The board extended his temporary license until the next meeting, 1/28, to give him and the town time to work out some differences, Mr. Rees told the board. The motion passed, 2-1, with Chairperson Daniel Freitas voting against the extension. He said he visited the station’s website and saw more cars for sale than the permit allows. “So I don’t know how serious he’s taking this,” said Mr. Freitas. Selectboard member Charles Murphy said he believed some cars were at Mr. El Rifai’s Wareham site. But Mr. Freitas said he would hold off until he was sure. The town also finalized the host community agreement with BASK, which is seeking to open a recreational marijuana facility in Fairhaven. The company already operates a medical marijuana dispensary in town. The recreational shop would be at the same location.